Im just trying to get an idea of how many members have misty headlights. My car is an 03 and had the clips installed in 2007 and my headlights still mist badly, Honda have refused to replace my lights because apparently there has never been an issue after the TSB (recall) to get the clips installed in 2007. So they refuse to accept any blame for my lights and if i want them replaced they expect me to pay £600 + fitting for new headlights. 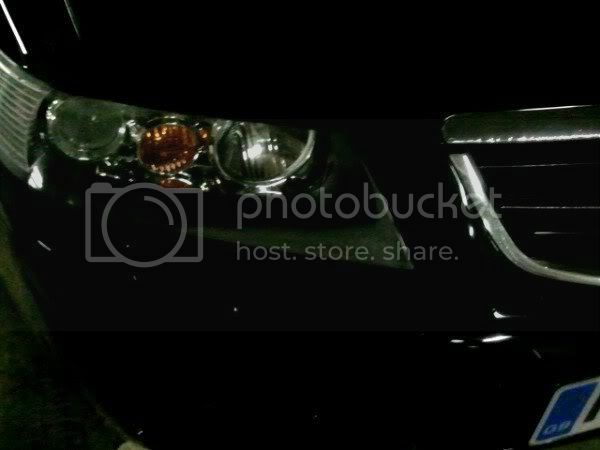 I am aware that other members of this forum have had problems before and after the clips were installed on there headlights so im trying to get an idea to confront Honda with. I have attached a couple of photo's so you know what im talking about, These were taken after a car wash and they do mist up a lot worse in the rain and are very bad in the snow we have had recently. Bad enough to reduce light output which is dangerous in my eyes. I will be sending Honda a letter in the new year asking for my lights to be replaced free of charge as they were obviously defective when they left the factory and the TSB has solved nothing. My experience with Honda may be beneficial to other members if i am successful in getting my lights replaced free of charge. I had this problem on my dads BMW it was so bad you could bash it and it would bead down. How i solve that was by taking it apart and waxing the rubber seals and rebuilding it. No moisture now. On my 4th gen after i install the HIDs i got a tiny patch of condensation on one headlight and i solved that by adding silicone around the wires which enters the rubber cover on the back of the light. No moisture now. Mine mist up quite badly ever since the dealer replaced the clips without asking me last year, honda dealers don't have a clue in my opinion kwik fit are higher trained. Only way with this will be to remove headlights dry them out, hair dryer / near radiator works well but they need to be 100% dry. Then as CJ recommends you need some silica gel packs inside and check all the seals properly. The main beam cap seals have a habit of getting twisted or caught up by previous owners who where impatient especially on the diesel as access on the drivers side is tight. mine mist up to a similar extent to yours when i've washed it, not really sure about other times cos i've not been botherered to look. Would be interesting to know how you get on though. mine were a lot worse than that, I had a recall message, went and got "clipped" still a little build up in the wet so went back and at first was promised new units, but then this was retracted by H uk. MOT threw up "dim" lights, and on investigation by me I found the bulbs were worn out, i.e. burn marks on the stems. Changed the bulbs and I can see now. Still misting on the odd occasion but I can live with it. To be fair i understand that i can add silica gel packs and remove the light and dry it out, But why should i.?? The car cost enough and Honda have admitted there is a problem so should rectify it. I have owned quite a few cars in my time and headlights that mist up on a 7 yr old car is completely unaceptable. I would need to remove my lights completely and split them to clean the lenses on the inside because they have tide marks on them where this has been going on for so long. Why should i be expected to take such drastic measures to solve a problem that Honda know exists. Honda have acknoweded there is a problem by issuing a recal to add clips to the lights which in my case and others clearly does not work, So they should either repair or replace, Its as simple as that. If your TV didnt work properly you would get it repaired or replaced its that simple. My car is in mint condition but is severley let down by the lights through no fault of my own and i should not be expected to remove and repair faulty lights due to a manufacturing defect. Lighting on a car is pretty important for obvious reasons and anything that can effect output should be repaired without any fuss because at the end of the day we carry our family and children in our cars. During the recent snowy weather we have had my lights completely misted up and light output was reduced enough for me to think a bulb had blown, This is a safety issue as far as im concerned. And if you are lucky enough to have standard HID lights there is a possiblity that water ingress can cause a bulb or 2 to blow. Just what you need on the motorway in the evening. My car had the recal done before the TSB expired and it does not work (or did not work) so Honda should just replace the lights with non defective lights. If you read the TSB you will find that it clearly states that if water is present the lights should be replaced. In your case it seems that water was still inside the clusters when the clips were installed. So you are quite within your rights to demand new lights. All they have done is seal water inside with the clips. 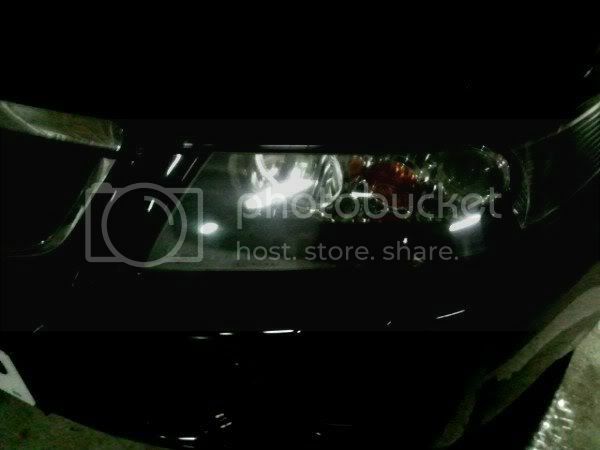 Fella that isn't bad for headlight condensation. get two medium size silica gel bags for each headlight from ebay....and that will be history I can assure you. Also get the low beam covers off and look at the large O ring look out for distortion and cracks even the smallest imperfection change them. if you do make sure they are slowly and correctly installed. Majority of the times it these caps which are not sealing correctly. Thats just after washing the car, They get much worse in the wet and snow. I'll sit back and see how you get on. As I said I got nowhere. Mine does the same but its not to bad and usually if the light have been on for a wile it seems to go. Mate i will give it both barrels. If you dont try and all that. I hope you didnt go to Honda ranting in this same manner , that could be the reason why it was turn down ....and that is being blunt. For the record there was no recall for headlights on the 7th gen. Honda decision to approve headlight replacement is based on various factors one of the major one being full Honda dealer servicing record. I dont know about you but there are a lot of owners here who hate dealers with passions and then they expect Honda to bend backwards to resolve problems. It a two way street guys. I hold no Vendeta against Honda dealers and have found them to be fine if expensive if im totaly honest. My gripe is not with my local dealer or any dealer for that matter, it is with Honda UK and the way they take your money via original purchase and servicing but dont want to know when there is a problem which they are aware of. I am quite within my right to have a little rant when my car cost the best part of 20k and has full dealer history (not that it should matter as the lights are not a servicable item) and the lights are a potential MOT failure which i am expected to fork out in the region of £800 to replace. All i want are lights that dont mist up on a 7yr old car. Not that much to ask really. Mine does it but when I have the lights on for a short while itclears but comes back. As I use lights pretty much all the time its not a major issue. My headlights misted a bit worse than above photo. Dealer had installed clips. Went back and explained they were still misting. Asked me to take a photo of them when bad which they sent to Honda UK and got new headlamps fitted FOC. I'm an old timer from thaoc but - embarrassed to say - this is my first real post here. Sorry! Anyway, my experience with fogged-up headlights: I have a 53/04 CL7 2.0 litre executive. Purchased it in London in July '08 and imported it Ireland. The headlights were misting and I read up on this in the forum. Based on what I read, I went to a Honda dealer in Dublin who I asked to service the car and asked them to consider replacement lights based on what I had heard. They agreed - despite the fact that the car wasn't sold or serviced by them (although it did have a FHSH) and the Honda importer that footed the bill wasn't even Honda UK! And I've had no problems since. If headlights are ok, don't get them clipped - the problem is caused by the seals between the glass and the reflector breaking down and the clips - instead of pressing the 2 pieces together - can break an ok seal. I personally would not be happy with a silica bag - honestly I'd consider it a fire risk. Even if I'm wrong, having a bag of crystals sliding around inside the light doesn't strike me as a very professional fix. Last point - I agree with Pepster. Going in with both guns blazing will probably not help your case. I was ultra polite and friendly (not to say you weren't) but I was also informed and - again casually - quoted every source I could in terms of this being a known fault and how I understood it to be standard practice for the lights to be swapped out on a fix-on-fail basis. Edited by arab, 07 January 2011 - 10:50 PM. Original - just as Soichiro intended ! Guys going back to the days of THAOC this was one of my first problems. I had no misting in my headlights whatsoever then I put the car in for service they checked on recalls and found that it needed the clips fitting so they did it lo and behold some weeks later my headlights started to mist up it was found that they had only fitted the clips to the top of the lights and not the bottom so consequently the bottom seal opened allowing the moisture to get in. After some consultation on the forum and speaking to HUK and my local dealer taking photos for HUK ,the head lights were changed(at first the dealer wanted me to pay labour) but HUK sorted them out. Now some 3 years on I noticed in the cold weather that there was slight misting but this goes after they have been on a while. Moral of the story do things in the correct way be curteous to those who can help you and see how it goes. 54 reg 2.4 type S,Arctic Blue Pearl,17" SANTINO Alloys,Eibach adjustable rear camber arms,Multi CD changer(Honda Fit), not many miles done????????? ?